Third year student Amritha explains what life as an Optometry student, on your journey to becoming registered with the General optical Council, is like. Hi! My name is Amritha and I am currently in my third year as a BSc Optometry student at City University London. This year has been both exciting and challenging. Each year the course gets more and more fascinating and as you build upon your knowledge you truly start to feel like a clinician that is able to comfortably diagnose and treat patients with regard to their eye health. One of the best aspects of City’s course is how soon you are exposed to the clinical setting. Within the first week you begin to learn how to use your instruments; whilst this seems a little daunting at first, it is an exciting way to start the year and ultimately means you have more time to get the practice you need to become a great clinician. This year we are fortunate to have the new City Sight centre which consists of brand new state of the art clinics that provide a great environment to enhance our learning. Even though I had already studied another degree at a different university, I was still quite nervous about settling in to a new environment and making new friends. This is where the City Buddy Scheme is great in helping first year students settle in to university life. You are given a City Buddy in the year above that does the same course so they can offer guidance and tips to doing well whilst immersing yourself in student life. Now that I am a second year student, I have been able to help my own City Buddies in the year below make their way through their first year of university. The modules I’ll be studying this year include Clinical Skills, Contact Lenses, General Pathology, Visual Science, Dispensing and Binocular Vision. As a second year student, we are also preparing to find places for our pre-registration, therefore at the beginning of this year we were given talks from different companies about what they offer in their programmes. Following on from these presentations, we handed in applications to companies who we were interested in working for during our qualifying year as well as attending interviews and gaining optical experience in our free time. The life of an Optometry student can get a little hectic at times, however there are so many extracurricular societies and clubs that can help you to maintain a balanced university life. For example the Optometry Society (OpSoc), which is run by students, held entertaining events such as the end of year Eye Ball and a Halloween night at the City Student's Union Bar in 2015. They are a great way of meeting students from the year and other courses whilst having a great time! The Association of Optometrists also hold events that allow you to connect with Optometry students from other universities, an example being the AOP Student Eye Opener Conference which involved a weekend away at Centre Parcs. Here, we were given presentations regarding our pre-registration year and information about other career opportunities including the independent prescribing course. Whilst it was a very informative weekend, we were also given some down time in which we explored the resort and attended a dinner dance ball. This is where they announced the winner of the AOP AFTA award which is given to the university that submitted the best video promoting optometry that year. 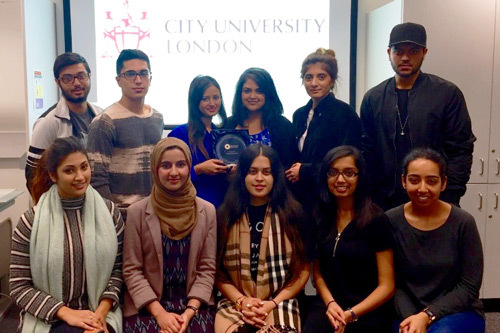 I participated in making our submission; it was such a fun experience that allowed us to create close bonds with students across the year and I am proud to say that in 2015 City University were the AOP AFTA award winners! As an optometry student you are also able to apply to participate in volunteer work for organisations such as Vision Aid Oversees, which take small teams abroad in order to give eye examinations and dispense glasses to those who are unable to access it. Moreover, organisations in the UK such as Crisis at Christmas focus on helping homeless individuals, one aspect of which includes eye tests that they may normally not have access to, therefore Optometry students are needed to help dispense and pre-screen for the guests that attend. You may be wondering what lies ahead after your journey at university comes to an end. One of the many reasons I chose Optometry is the multitude of potential career paths including working in a high street opticians, participating in hospital Optometry (which we are given the privilege of experiencing during third year at Moorfields Eye hospital), domiciliary work, research, volunteer work in the UK and abroad, teaching at a university or even embracing the business side of this field by opening or running your own practice! There is also the opportunity to specialise further to provide enhanced clinical care to patients by undertaking the MSc in Clinical Optometry which is offered by City University London. Whilst the course is structured fantastically to aid your learning and the facilities are brilliant, it is the lecturers and clinical staff that go above and beyond to support the students that makes City University stand out. Although their collective credentials alone are impressive, it is their constant availability to answer any queries and willingness to put in the extra time to support students that is second to none. City University is a great place to start your career as an Optometrist and we look forward to you joining our close knit community!